This article is about the transformation. For the ascended state, see Super Saiyan Second Grade. "Gohan's power has grown far beyond mine. When we were training in the Hyperbolic Time Chamber, I knew he had hidden strengths, but I never knew he would ascend to this level." — Goku in "Cell's Break Down"
Super Saiyan 2 (超スーパーサイヤ人じん２ツー, Sūpā Saiya-jin Tsū), initially referred to in-universe as Ascended Super Saiyan and at the time of its debut also known as Super Saiyan Fifth Grade, is the direct successor to the first Super Saiyan transformation. It is very similar to the original form in appearance and attainment; however, the power output is far greater, as speed, strength, and energy output all drastically increase. There are four ways to achieve this transformation, a requirement for all four is that the Saiyan must first gain a large quantity of energy (usually by training), far beyond that required for the first Super Saiyan form. The first method is that the Saiyan must experience a powerful emotional upheaval, much like the Super Saiyan transformation, but to a greater extent. Because of the intense emotion required to initiate the transformation, any mastery of the Super Saiyan state and mental stability attained therein is negated, and the naturally remorseless nature of the Saiyan race is magnified, requiring them to master the personality adaptations to an even higher degree. Even Gohan with a gentle and docile personality became a hotheaded, merciless fighter after transforming, opting to torture Cell rather than kill him, despite Goku's pleas. The second method of obtaining the transformation is simply through harsh training. The third method is merely through instinct from a desperate need; if the Saiyan is in a situation that needs a quick and desperate action, like saving somebody from almost getting killed, the Saiyan will instinctively and in a rapid instant, transform, quickly making them more powerful. The fourth method is for the Saiyan to feel out the tingly feeling in their back. The power output emitted by this form is greatly increased as well, as it doubles the strength of the regular Super Saiyan transformation. The golden hair brought on by the original transformation becomes longer and rigid and stands up even more. Some users like Gohan, Goku, Vegito, and Bardock lose a few strands of hair. Increased energy radiation causes the aura to take on a jagged, fierce flame-like appearance rather than smooth or flowing. Because the energy output and radiation are higher than that of a Super Saiyan, the aura pulses at a higher frequency. Muscle mass is barely increased, but energy output is multiplied by more than the regular Super Saiyan transformation; such that greater amounts of the Saiyan's increased energy reserves can be used at once for much more powerful energy attacks without the onset of exhaustion later. Even speed is increased proportionally, unlike the Super Saiyan Third Grade state which causes the muscle mass to swell to the point of impeding the user. Another notable feature of the form seen in pictures from the manga, some scenes of the show, and almost all Dragon Ball Z video games is the electrical aura; many electrical sparks (normally blue, but gold in Dragon Ball Z: Budokai 3 and Dragon Ball Heroes) constantly surround the body, especially when charging up. However, they are not always present (especially in the anime; Gohan and Vegeta lack the trait completely in some episodes) and may sometimes appear on a charging Super Saiyan (such as Vegito) causing some viewers to mistake the regular Super Saiyan form for a Super Saiyan 2. In Dragon Ball Super, Future Trunks' hair as Super Saiyan 2 does not change from his Super Saiyan in the anime version, a trait that was taken to Dragon Ball Xenoverse 2. However, in the manga version, his hair stands up and becomes spikier. In Dragon Ball Heroes, Gogeta's Super Saiyan 2 is remarkably different from his Super Saiyan form, the hair grows spikier and slightly longer, making it very easy to tell the difference between both forms, while Vegito's Super Saiyan 2 has the same visual looking of young Gohan. Super Saiyan 2 of adult Gotenks is just more spiky, as well as Xeno Trunks. Bardock's version of the form is the most worthy of noting, as he has the hair of a regular Super Saiyan, however, it was corrected for Xeno Bardock, having two side bangs with a middle one longer. In the manga version of Dragon Ball Super, Future Trunks' Super Saiyan 2 looks almost like his Super Saiyan form, with the exception of the two thin bangs framing his forehead, which disappear. Caulifla's Super Saiyan 2 spikes up her hair completely, making the lower part standing above her shoulders. Her bangs become separated from each other, with two on the sides and one in the middle, similar to Goku's Super Saiyan 2 form. "He did it right. He increased his strength without losing speed." The Super Saiyan 2 is twice as strong as regular Super Saiyan, so the form multiplies the Saiyan's base power by 100x times its normal amount. According to Goku, Gohan technically first transformed into this form during their training in the Hyperbolic Time Chamber. This scene was shown in a filler flashback in the anime, and it is shown that Gohan was too exhausted to maintain the form when he first transformed. 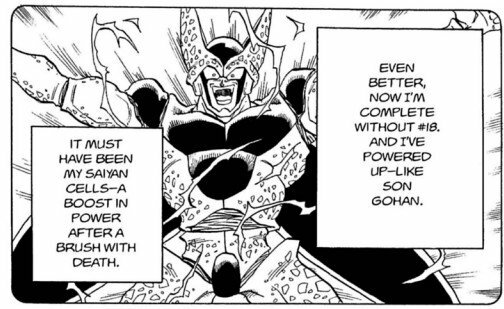 This is the reason why Goku knew about this power before Gohan transformed into it during his fight with Cell, and was also the reason why Goku decided that, if anyone had a chance at defeating Cell, it was Gohan. The first time the Super Saiyan 2 form was fully achieved and maintained by Gohan occurred after he witnessed the Cell Juniors' attack on the Dragon Team and Android 16's death at the hands of Cell. Not long after, Cell also achieved the Super Saiyan 2 form, referred to as his "Super Perfect form" through Saiyan Power as a result of self-destructing. Goku coins the form for the first time as "Super Saiyan 2"
The power of the Super Saiyan 2 form skyrockets far beyond the power of the Super Saiyan, Super Saiyan Second Grade, and Super Saiyan Third Grade. Perfect Cell and Bojack, who could both easily dominate those in the Super Saiyan Second Grade forms and were stronger than Super Saiyan Full Powers even without accessing their full strength, were easily slaughtered by Gohan in his Super Saiyan 2 form. In addition, when Perfect Cell produced seven Cell Jrs., each of the Z-Fighters were unable to fight evenly with even one of them (including Goku, Vegeta, and Future Trunks). However, when Gohan fought the Cell Juniors in his Super Saiyan 2 form, he killed all of them effortlessly on his own with simple, single blows while also being unaffected by their most powerful attacks. Gohan proceeded to fight and severely injure Perfect Cell with just two punches, even after the android unleashed his full power. However, in a Kamehameha struggle against Super Perfect Cell, Gohan had a very hard time due to having his left arm broken by Super Perfect Cell's attack when he defended Vegeta after he attacked the Android to try to avenge his son's death (a blast which was stated to reduce Gohan's power output to less than half its normal amount), with the manga also implying that Cell did not put his full power into the blast when he injured him. It was only with help from Goku and Vegeta that Gohan needed to summon enough power to destroy Super Perfect Cell. Seven years after the Cell Games, Gohan demonstrates the Super Saiyan 2 transformation to Kibito at the World Martial Arts Tournament. Gohan utilized his Super Saiyan 2 form to battle Dabura. However, Vegeta mentioned that Gohan was weaker than it was during the Cell Games due to his lack of training. Following the events leading up to Majin Buu's revival, Goku and Majin Vegeta both reveal that they also attained the Super Saiyan 2 transformation and fought evenly matched using that form. The power of Majin Buu is shown to far surpass the power of the Super Saiyan 2 form; Vegeta inflicted little damage to the monster, and even after he expelled all of his energy at once in a devastating suicidal explosion, Majin Buu managed to fully regenerate after some time. During the fight with Kid Buu on the Sacred World of the Kai, Goku uses his Super Saiyan 2 initially to fight Kid Buu in the anime and then powers up to Super Saiyan 3 (however, Goku goes straight to Super Saiyan 3 in the manga). Vegeta also battled using the Super Saiyan 2 form for a short time in order to buy time for Goku to collect energy for his Super Saiyan 3 form. Gotenks has been shown as Super Saiyan 2 twice in the anime series, although both times were the ones that he was powering up to Super Saiyan 3 transformation, thus his Super Saiyan 2 was seen briefly in those occasions. It is stated in Daizenshuu 7 that Gotenks can transform into Super Saiyan 2. 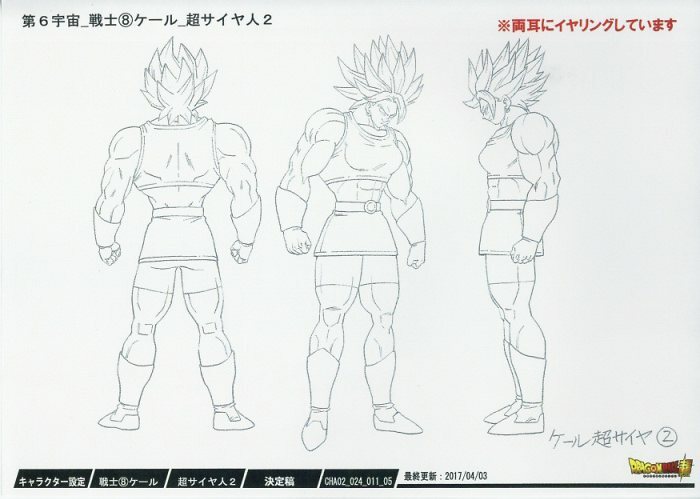 Due to bypassing Super Saiyan 2 when transforming from a Super Saiyan into Super Saiyan 3, his Super Saiyan 2 form is never fully revealed in the manga or the anime and remains unused. Adult Gotenks is playable as Super Saiyan 2 in Dragon Ball Heroes. In Dragon Ball Super, Goku uses the Super Saiyan 2 form against the God of Destruction Beerus but he is totally outmatched. None of his punches can hit Beerus, much to Goku's surprise. Then he is forced to ascend to Super Saiyan 3. After seeing his wife being hit by Beerus, Vegeta becomes an outraged Super Saiyan 2. While in this form and unlike Goku, Vegeta can strike a series of punches and kicks on Beerus, Beerus gets surprised initially, but then realizes that it was not the Super Saiyan God form he wanted to see, but still allows Vegeta to perform some attacks on him until his rage was over. In the anime, Vegeta's fight against Beerus punch to Vegeta's cheek, which makes him rotate really fast, but Vegeta surprises him with a double handed punch, sending Beerus up above the Princess Bulma ship. Vegeta then appears in the midair and yet again hit Beerus, sending the God of Destruction straight to the ocean, opening it. Vegeta can hold his own at this moment and starts shooting ki blasts at Beerus, creating a smokescreen. From it, Vegeta reappears close to Beerus and launches his Galick Gun, but Beerus blocks it without taking any damage. Unfortunately for Vegeta, this was all he could do and thus was defeated with a single slap in the chin, but unlike the movie version, Vegeta does not get knocked unconscious. During the "Future" Trunks Saga when Goku faces off with Future Trunks, Trunks is revealed to be able to transform into a Super Saiyan 2. Goku later says Future Trunks is much stronger than he was before, although it is not revealed when Future Trunks achieved this form. Although Goku was holding back, Future Trunks as Super Saiyan 2 was able to press him, much to Goku's enjoyment. Later in the anime, the Super Saiyan 2 form is used by Goku in his first fight with Goku Black. Super Saiyan 2 Goku was strong enough to deal some damage and leave Goku Black in pain. Goku returns to use this form again during his brief fight against Zamasu in Universe 10. While the battle is even for a while, Goku soon manages to overpower Zamasu. Future Trunks returns to use this form briefly during his training with Vegeta, he also transforms into Super Saiyan Third Grade from his Super Saiyan 2 form in order to trick Vegeta and hit him, but to no avail. In the manga version of Dragon Ball Super, Future Trunks fights an even battle with Goku, both as Super Saiyan 2. Goku notes that Future Trunks is far stronger than Gohan was previously. Future Trunks displays mastery over the form, able to power himself up so much that he matches Goku's power even as a Super Saiyan 3 without even transforming. It is revealed in the Super manga that Future Trunks first attained the form in a desperate battle with Future Dabura, witnessing the death of Future Kibito. This form is used again in the Universe Survival Saga when in the manga, Goku uses this form against Top but had to power to Super Saiyan 3 due to the Zenos being unimpressed by the lack of change. When Gohan was training with Piccolo, who proved to have grown too strong for Gohan to fight as a Super Saiyan, Gohan transformed further into Super Saiyan 2. Initially, Piccolo still proved too powerful, easily able to subdue Super Saiyan 2 Gohan. Midway through the match, Piccolo's words resonated with Gohan, allowing the latter once again fully ascend into his Potential Unleashed state, allowing Gohan to overpower his mentor without Super Saiyan 2. During Gohan and Goku's sparring session. As Gohan ascends into his ultimate state, Goku uses Super Saiyan 2 to battle Gohan. In the anime, after learning how to transform into Super Saiyan from Cabba, Caulifla also manages to transform into Super Saiyan 2 while saving Cabba from being hit by Kale. Although neither Cabba or Caulifla herself notice this as both of them do not acknowledge a form beyond Super Saiyan. During the Tournament of Power, both Goku and Caulifla use Super Saiyan 2 in their battle. It is shown that the Legendary Super Saiyan form is much more powerful than Super Saiyan 2, as Kale managed to overpower Super Saiyan 2 Goku in the tournament. Goku later uses the Super Saiyan 2 form again against Jiren to no avail. In the anime, during his battle with Monna, Cabba also attains Super Saiyan 2, with this transformation, Cabba is able to defeat Monna. He also uses this form again during his fight with Frieza, however, even with the Super Saiyan 2 form, Cabba is no match for Golden Frieza, resulting in him being knocked out of the arena. Against Goku, Kale turns her Super Saiyan 2 state into a "true legendary Super Saiyan". Kefla reveals her Super Saiyan 2 form during her battle against Ultra Instinct -Sign- Goku; however, the form did little to help, as Goku dodged most of her attacks until Kefla was knocked by a Kamehameha. By the time of Dragon Ball GT, the Super Saiyan 2 form has been majorly outclassed by Super Saiyan 3 and the new Super Saiyan level, Super Saiyan 4. When Goku appears on the battlefield to fight Super 17, he fights in the first level Super Saiyan state before using the Super Saiyan 4 form without any use of either the Super Saiyan 2 or Super Saiyan 3 levels. Vegeta and Gohan both appear to briefly use the Super Saiyan 2 form. Gohan seems to use it during the battle with Super 17, as his hairstyle changes to match that of a Super Saiyan 2. Vegeta also seems to briefly power up into a Super Saiyan 2 just before the end of his fight with Super 17, though he never gets a chance to fight in the form, the reason for this is that when Vegeta is a Super Saiyan and gets back up after being knocked down by Super 17, the transformation sound effect is heard, indicating that he had once again transformed into Super Saiyan 2. Vegeta also appears to transform into a Super Saiyan 2 in his final attempt to defeat Omega Shenron. Additionally, it is implied that when Baby Vegeta transforms into Super Baby Vegeta, he is in the Super Saiyan 2 form. "I see.... Who knew that kind of transformation existed… But… It's not like I was completely satisfied with this form either…"
In the Dragon Ball Super manga it is revealed that like how the original Super Saiyan form could be upgraded through training to gain power enhancements or become mastered, the Super Saiyan 2 form can be improved as well. If the user of Super Saiyan 2 submits themselves to intense training, they obtain the ability to power up their Super Saiyan 2 state to possess power equal to a Super Saiyan 3, however it is no match for a Super Saiyan God, as shown when Goku defeats Future Trunks in a single blow with the form. Eventually, after training with Vegeta, Future Trunks became stronger in this state, able to hold his own against Goku Black as a Super Saiyan Rosé for a brief time, buying just enough time for Goku and Vegeta to return to the future timeline - though at that point Black has Future Trunks at his mercy. As displayed by Vegeta the Super Saiyan 2 form can be substantially amplified in power through rage, this ability is called the Quake of Fury. Vegeta attained this power-up in anger of Bulma being slapped by Beerus, and it was implied later that he retained the ability to use it - as during the "Future" Trunks Saga Super Saiyan 2 Vegeta was shown as being stronger than Super Saiyan Goku Black, whose base form alone surpassed the tired Future Trunks' Super Saiyan 2 form. Through a massive amount of rage, a user of the Super Saiyan 2 state can power it up into Super Saiyan Rage. Super Saiyan Rage's aura is similar to that of the Super Saiyan Blue form. The Berserk state is attained when a user of Super Saiyan is corrupted by Cunber, transforming into the Berserk Super Saiyan 2, unlike the normal Super Saiyan 2 this state possess black electricity in it's aura and lacks pupils. Spirit Bomb Super Saiyan - By absorbing a Spirit Bomb, a Super Saiyan 2 gains a huge increase in power. Super Saiyan C-type - According to Dragon Ball Z: Dokkan Battle, the Super Saiyan C-type form is a Super Saiyan 2 form. Legendary Super Saiyan - the Legendary Super Saiyan form has been referenced as being a Super Saiyan 2 form. Legendary Super Saiyan 2 - Kale possess her own Super Saiyan 2 state, which is an evolution of her Legendary Super Saiyan, it is stronger than the berserk form and possess its green hair. Broly utilizes a berserk Super Saiyan 2 form in Dragon Ball Kai: Miracle Battle Card. Super Vegeta 2 - An alternative variant of the Super Saiyan 2 form usable by Vegeta and the two Future Warriors in the Xenoverse series, it has greater ki manipulation than a normal Super Saiyan 2 and a different transformation scene. After the 1.09.00 Update in Xenoverse 2, it can be unlocked for Vegeta's custom skillset after purchasing it for 15 TP Medals in Partner Customization which allows Vegeta to transform into up to Super Vegeta 2 as his default Awoken Skill in that Skillset only allows him to access Super Vegeta (Vegeta's version of the standard Super Saiyan form). Villainous Mode (Super Saiyan 2) - A Villainous Mode enhanced Super Saiyan 2 form used by Vegeta and Gohan, it has the appearance of Potential Unleashed when used by Gohan. "Believe in yourself son. Unleash your true power, it's the only way." The Super Saiyan 2 form makes its first movie appearance in the film Dragon Ball Z: Bojack Unbound, where the Z Fighters struggle to combat Bojack and his henchmen. After being saved from Bojack by Goku (who used Instant Transmission to teleport from the Other World to Earth) and hearing his father's words of encouragement, Gohan taps into his Super Saiyan 2 powers and defeats Bojack and his henchmen in a matter of minutes. Gohan also uses this form to battle Broly when the latter reappears in Dragon Ball Z: Broly - Second Coming. Despite putting up a far better fight than he did previously, Gohan is outstripped by the Legendary Super Saiyan's massive power. However, this is partially because of Gohan's lack of training that made him noticeably weaker up to that point, and since Broly survived being impaled in the stomach by Goku's punch in Dragon Ball Z: Broly - The Legendary Super Saiyan, Broly's power most likely increased due to achieving Saiyan Power after recovering from near-death, as all beings with Saiyan genetics undergo when in the same predicament. Though, to Gohan's credit, one of his strikes was powerful enough to catch Broly off-guard (whereas nobody in Broly's first appearance could damage him in the least), as Broly is knocked back when kneed in the face by Super Saiyan 2 Gohan. The Super Saiyan 2 form is also used by Goku and Vegeta in the movies Dragon Ball Z: Fusion Reborn and Dragon Ball Z: Wrath of the Dragon, against Janemba and Hirudegarn respectively. However, in both of the movies, either the Fusion Dance or the Super Saiyan 3 form is used to kill the main enemy. The form appears again and briefly in the movie Dragon Ball Z: Battle of Gods, with Goku showing it to the God of Destruction Beerus on King Kai's Planet and Gohan when he killed Cell in a flashback shown in the extended version of the movie. Vegeta also uses form against Beerus after the latter hits Bulma. The form is playable for Gohan, Goku, and Vegeta in several Dragon Ball Z video games. In Dragon Ball Z: The Legacy of Goku II, this form is named Super Saiyan Rage. This was changed in its sequel, in which Gohan states it to be a form "far beyond that of Super Saiyan" and Goku labels it "what you could call a Super Saiyan 2". It is however not playable in a different fashion like in the previous game, whereas Super Saiyan 3 is. Vegeta is playable as a Super Saiyan 2 in the video game Dragon Ball GT: Final Bout. In Dragon Ball Z: Budokai 2, Dragon Ball Z: Budokai 3, and Dragon Ball Z: Infinite World, Future Trunks is given the Super Saiyan 2 form. The form is virtually no different to his previous form in the game in terms of looks and techniques. This might be a mistake made by the game developer, originally has his 3rd Grade Super Saiyan form instead of Super Saiyan 2 in the first game. However, in Dragon Ball: Heroes and Dragon Ball Z: Dokkan Battle, he attains the form and his hair straightens up and becomes spikier compared to his regular Super Saiyan form. In Dragon Ball Z: Shin Budokai - Another Road, Future Gohan also achieves Super Saiyan 2 during the events of the game which is a what-if scenario about Majin Buu being released in Future Trunks' timeline. In Dragon Ball Xenoverse and its sequel, the form can also be used by the Saiyan Future Warriors. The form drains energy noticeably faster than the Super Saiyan form and slightly raises attack power more than Super Saiyan in the first game. In both games, Vegeta appears with his Super Saiyan 2 under the name "Super Vegeta 2", which focuses on raising the power of ki blasts. In both games, only the Future Warriors' hair color changes when using the Super Saiyan 2 transformation and the only difference visually between it and the Super Saiyan form it its lightning aura. Super Saiyan 2 is the highest form of Super Saiyan that the Future Warrior can obtain in Xenoverse as they are unable to unlock the Super Saiyan 3 Ultimate Skill (which is exclusive to Goku and Gotenks). In Dragon Ball Xenoverse 2, Super Saiyan 2 is accessible via the Super Saiyan Awoken Skill which allows the user to transform into higher levels depending on the amount of ki. In Xenoverse 2, 4 ki bars are required to transform into Super Saiyan 2. Unlike its depiction in Xenoverse, the form does not drain ki and instead makes ki generation from melee attacks and Ki Charging Super Skills slow down more than the Super Saiyan form, though the slow down in ki generation is lesser than Super Saiyan 3. Also, the Super Vegeta Awoken Skill allows the user access the Super Vegeta 2 transform if the user has 4 or more ki bars (as there is no Super Vegeta 3 form). In Xenoverse 2, the Dragon Ball Super incarnation of Future Trunks and Teen Gohan are unique in that their Super Saiyan 2 Awoken Skill acts as a stand-alone transformation and is not stacked with their Super Saiyan forms (as Teen Gohan is all ready in his Super Saiyan Full Power state while Future Trunks only uses his Super Saiyan 2 form), though it still requires 4 ki bars to transform. It should also be noted that the Super Saiyan Awoken Skill used by GT Goku and Gotenks omits the Super Saiyan 2 form, thus it only allows the them to access their Super Saiyan and Super Saiyan 3 forms. It should also be noted that in Xenoverse 2 Prince of Destruction Vegeta automatically appears as a Super Saiyan 2 as his Prince of Destruction Vegeta form acts as a separate character like Vegeta's Super Saiyan Blue and Super Saiyan 4 forms. Bardock also attains his Super Saiyan 2 transformation in Xenoverse 2 while fighting Mira. In Dragon Ball FighterZ, if Teen Gohan and Cell are leading when fighting on Cell Games Arena stage, then a recreation of Gohan's transformation during the Cell Games will occur with 16 saying his final words before Cell crushes his head, triggering Gohan's Super Saiyan 2 transformation. Teen Gohan is also playable in his Super Saiyan 2 form. In Dragon Ball Heroes, some other characters can reach and are playable as the Super Saiyan 2 form. Beginning in January 2014 with Bardock was added. In March 2014, adult Gotenks was presented. In May 2014, Vegito appeared followed by Gogeta in July 2014. While not confirmed if Vegeta used this form during the Dragon Ball GT series, he attains it in since September 2012. In September 2015, Trunks: Xeno debuted. In Dragon Ball Z: Budokai Tenkaichi 3, Goku (GT) has all his Super Saiyan transformations with the exception of the Super Saiyan 2 form. Also, in Dragon Ball Z: Infinite World, Goku, and Vegeta's GT versions have all their Super Saiyan transformations apart from Super Saiyan 2. In the Funimation dub of the episode "Super Saiyan 3?! ", Goku says that Super Saiyan 2 is also known as "a Super Saiyan, that has ascended past a Super Saiyan". However, this should not be confused with the Super Saiyan Second Grade, which is a branch of the Super Saiyan level and also often referred to as Ascended Super Saiyan. Across the anime and video-game media, characters who occasionally transform into Super Saiyan 2 are portrayed with Super Saiyan hair hairstyle, with the addition of sparks. Super Saiyan 2 Gohan about to shoot at Cell Jr.
↑ Cell powered up like Gohan. ↑ Dragon Ball Super episode 93, "You're Our Tenth Warrior! Goku Approaches Frieza!!" ↑ Dragon Ball Z episode 187, "Cell's Break Down"